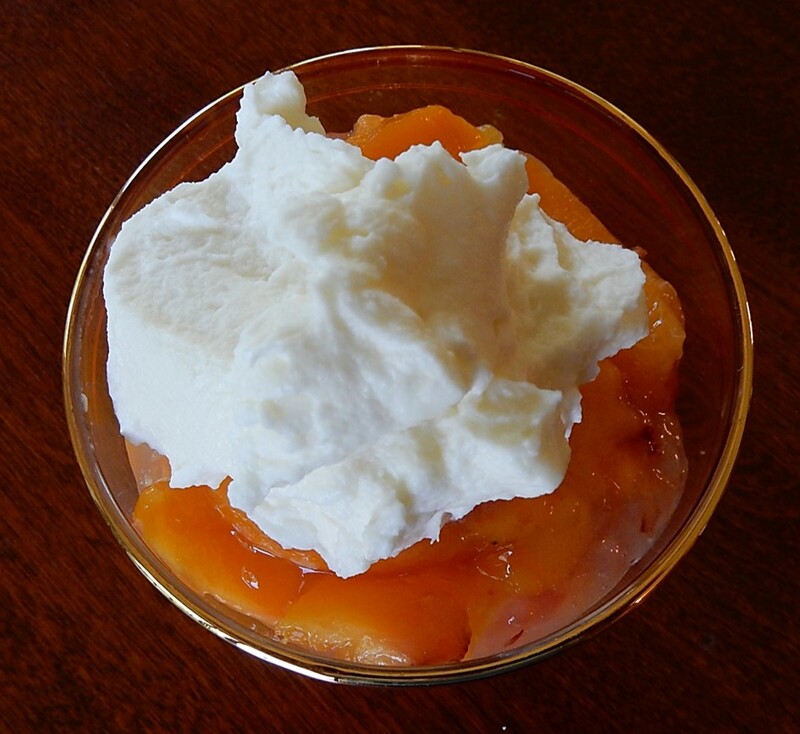 Now that the weather is getting hot – and strawberries are in season – I wanted to find a recipe for a tasty and refreshing strawberry dessert. 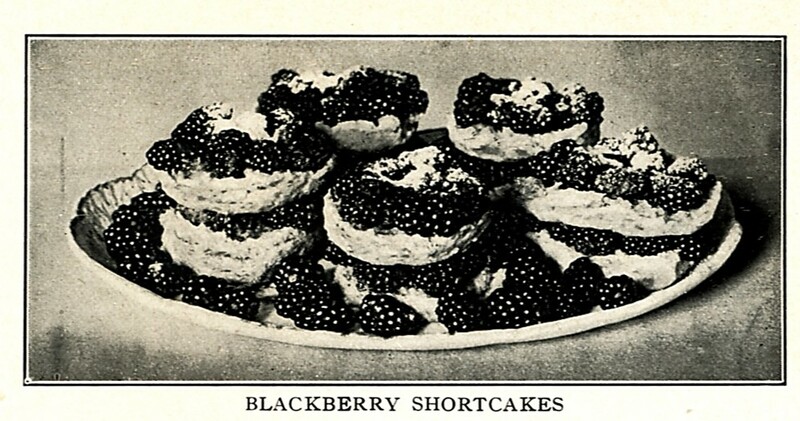 I searched through my hundred-year-old cookbooks, and I think I found the perfect recipe. 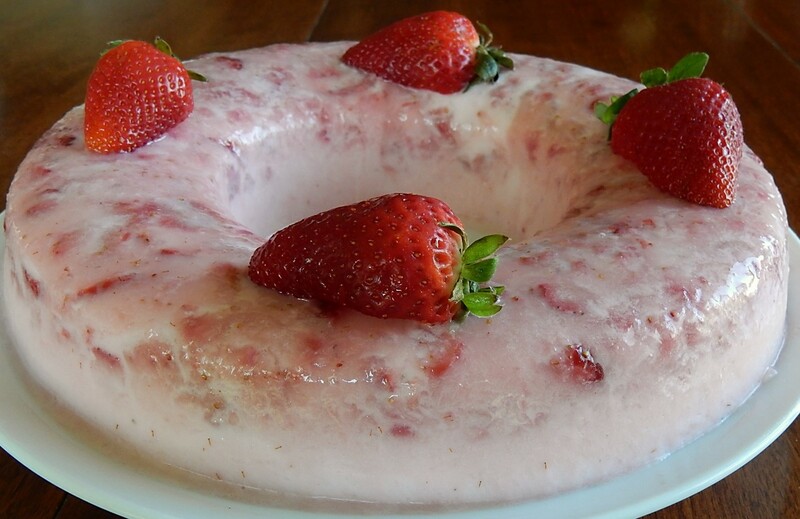 Strawberry Bavarian Cream is creamy and cool, and it made a beautiful presentation. 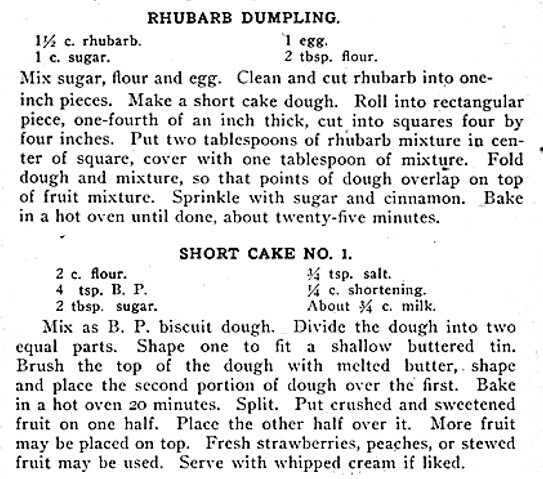 This recipe was in a 1905 church cookbook from Berwick, Pennsylvania published by “The Ladies of Directory No. 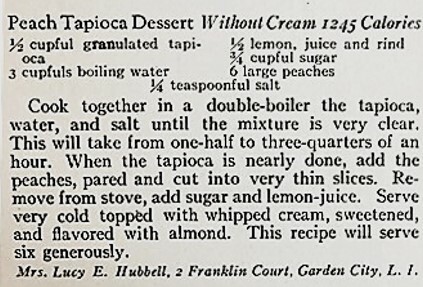 2 of the Aid Society of the Methodist Episcopal Church.” I’m very curious how the cooks who made this recipe in the early 20th century chilled this dessert. 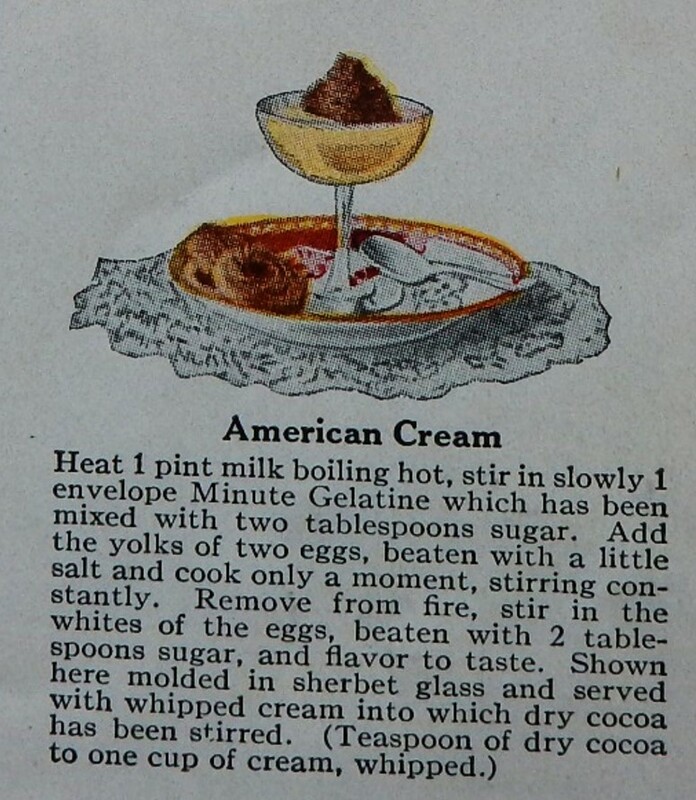 Most won’t have had a refrigerator; perhaps they refrigerated the Strawberry Bavarian Cream in an ice box chilled with a block of ice, or maybe this recipe was often made during the winter months using strawberries that had been canned the previous summer. 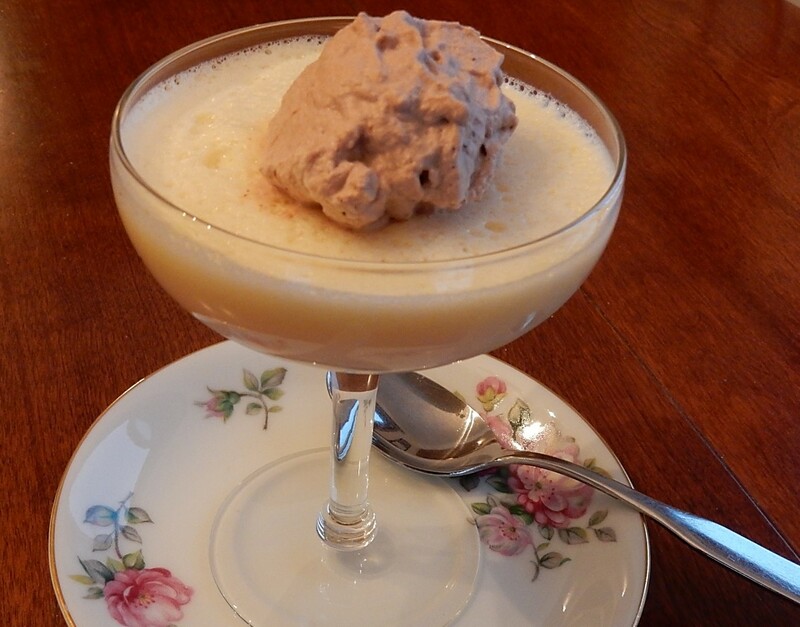 Regardless of how cooks in 1905 kept the Strawberry Bavarian Cream cold, this silky, delectable dessert is a winner. I know that I’ll make it again in the near future. Place the cold water in a bowl; then sprinkle the gelatin over the water. Let sit for one-half hour. Add boiling water to the gelatin mixture; stir until the gelatin is dissolved. Stir in the mashed strawberries. Chill just until the mixture is no longer warm. To serve: Quickly dip the mold in hot water, then unmold unto serving plate. Note: This recipe may also be made using 1/2 pint frozen or canned strawberries. 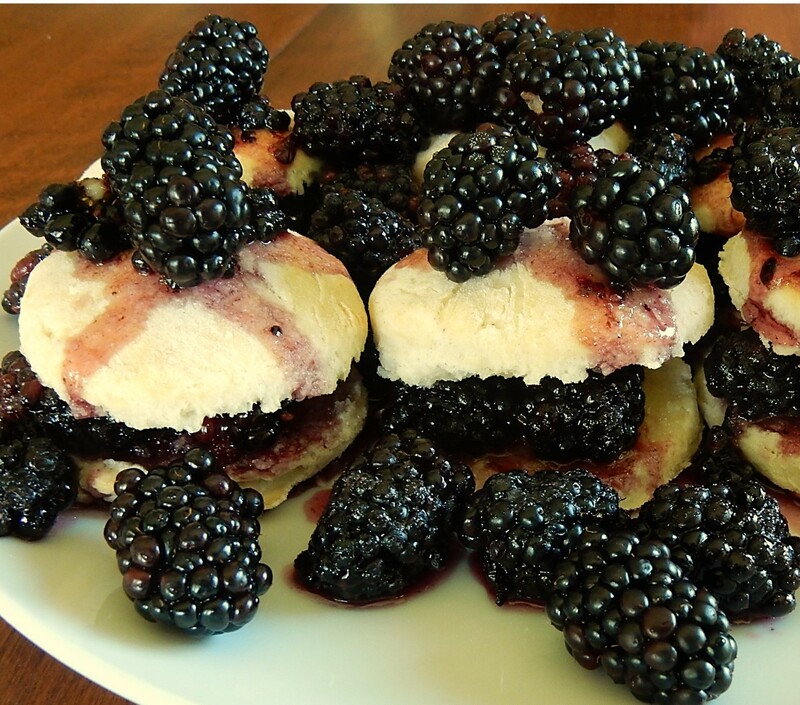 If frozen or canned strawberries are used as a substitute for the fresh berries, do not add the 1 cup of sugar. I recently made a recipe for Lemon Dumplings, and I have a conundrum. Should I change the name of a hundred-year-old recipe if the original name doesn’t come even close to describing the actual food? The dumplings are made by dropping a sticky dough into a boiling molasses syrup. 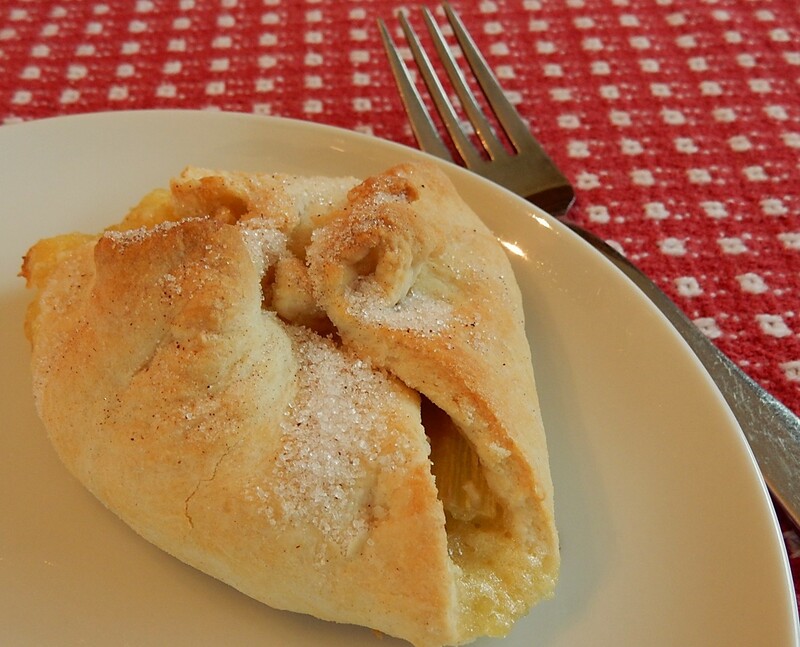 The dough is magically transformed into a dessert dumpling coated in the thick syrup that has a surprisingly complex flavor which combines the robust, nutty, sweetness of the molasses with citrus notes provided by lemon juice and lemon peel (which I assume is the reason for the name). 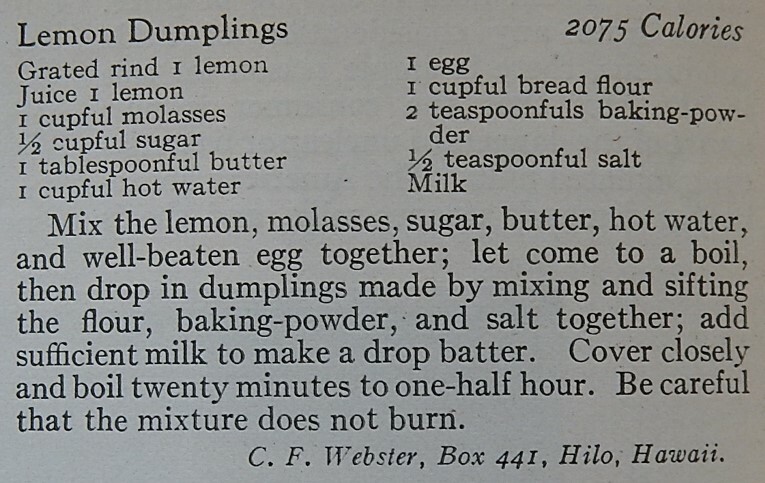 But, if I’d named this recipe, I won’t call them Lemon Dumplings. To me, the name “Lemon Dumplings” suggests a light, tart, yellow, citrus-flavored dessert. 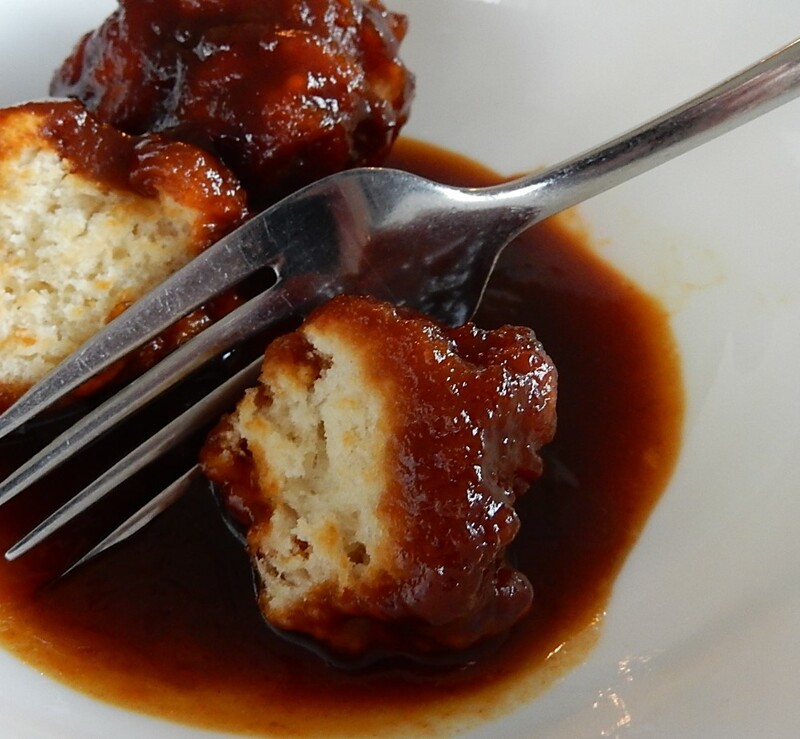 But the actual dumplings are a delectable old-fashioned dessert bread swathed in a rich molasses sauce. These dumplings should be called something like, “Molasses Dumplings” or “Great-Grandpap’s Favorite Dumplings” . . . or . . . anything but Lemon Dumplings. The Lemon Dumplings must have reminded him of something good, because they vanished with amazing speed. 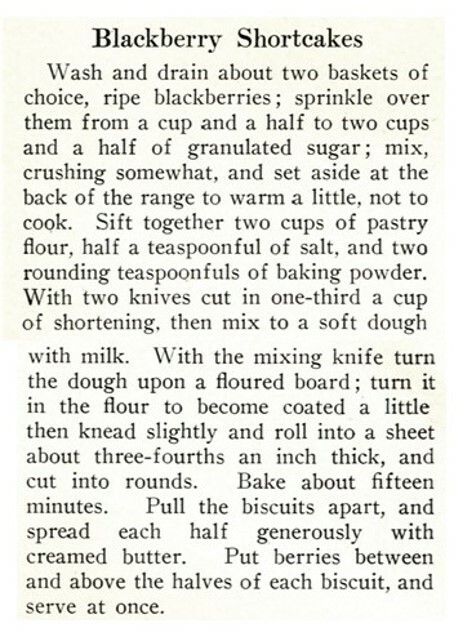 An aside: The recipes in the June, 1917 issue of Good Housekeeping had a new format that I hadn’t previously seen. The recipes included the number of calories. 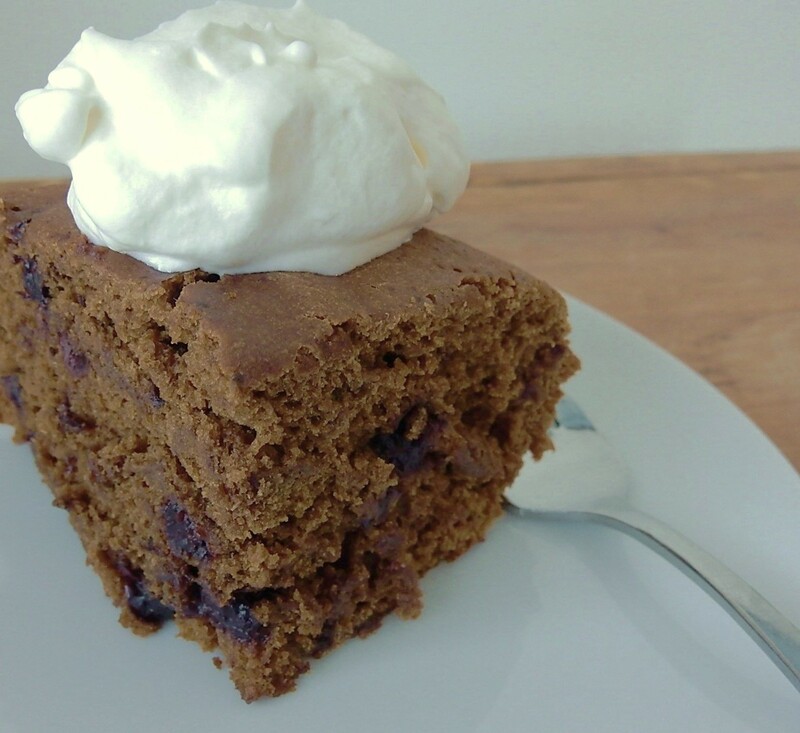 But, for some mysterious reason, the calories for all recipes seemed extremely high. Perhaps the magazine was reporting the total number of calories for the entire recipe rather than the per serving amount. Put egg in a mixing bowl, and wisk until smooth. Add grated lemon peel, lemon juice, molasses, sugar, and water, and stir until combined. Put syrup into a skillet, and add the butter. [Use a skillet with a lid.] Using medium heat, bring the syrup to a boil while stirring occasionally. In the meantime, sift together the flour, baking powder, and salt. Add 1/2 cup milk, and stir to combine. 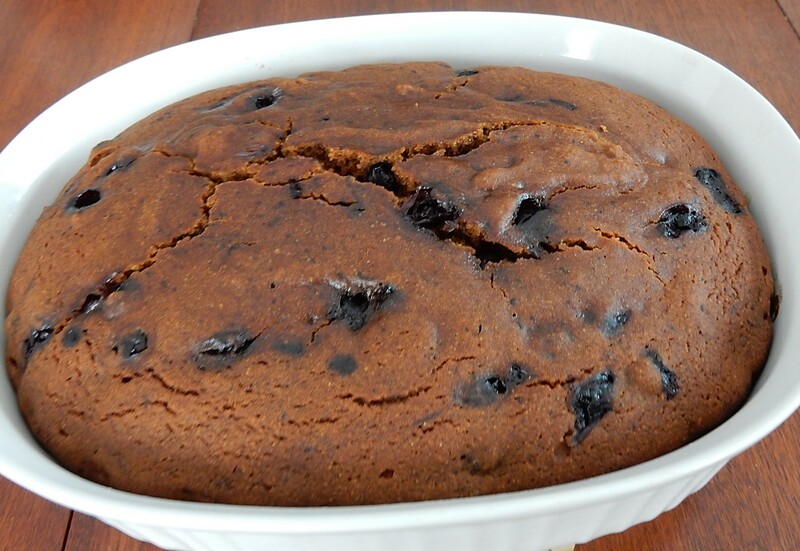 If the dough is too dry, add additional milk to create a sticky dough. Drop 1-inch balls of dough into the boiling syrup. Reduce heat to low, and cover pan. Cook for 10 minutes, then remove lid and gently roll the balls of dough to cook the other side. Put the cover back on and cook for an additional 15 minutes. Remove from heat.